Paul Weller – Fremantle Arts Centre – October 15, 2010 – Set List, Review!! – Paul Weller News! Paul Weller – Fremantle Arts Centre – October 15, 2010 – Set List, Review!! Set List Courtesy of Noah W.
13. Shout To The Top! Friday night in Fremantle and, by all reports, 52-year old Paul Weller was on his honeymoon, having tied the knot in Italy a couple of weeks ago. But spruced-up like a bridegroom in a snappy dove-grey double-breasted suit and white shirt the iconic Modfather was here to do other business on only his second tour of Australia in more than 20 years. And who could ask for a more breathtaking start to a concert? He set the tone for the evening by blasting straight into the rampaging rockers Moonshine, Fast Car/ Slow Traffic, From the Floorboards Up and 7&3 Is the Striker’s Name – all except one from this years’ extraordinary Wake Up the Nation album – and all topping-off under the three-minute mark. It was soon obvious that this was not a night for the cosy, complacent “dad-rock” of his early solo period. Instead he treated the fans to a generous 24-song set that combined the youthful enthusiasm of his days with The Jam – a pop art, mod-culture RAF roundel decorated one of the amplifiers – and mostly the fiercely visceral, wall-of-sound material from Wake Up the Nation. He re-tooled some of his better-known songs, like The Changingman, Broken Stones and Black River from standout albums Stanley Road (1995), As Is Now (2005) and 22 Dreams (2008) with the same dangerously overloaded instrumentation and textural eccentricities that exemplify his current musical direction. Newies such as Andromeda and Trees, along with the earlier Sea Spray and Black River, were full of weird experimental Revolver-era Beatles touches, including swirling psyched-out guitar, melotron and keyboards. The jumpy time signatures kept the band’s fearless rhythm section of drummer Steve Pilgrim and bassist Andy Lewis on their toes. Occasionally, he contrasted the strong dosage of rock with more mellow moments. The highlights here included the soulful reading of No Tears To Cry and the funky Aim High. The slow ballad Pieces of a Dream – where he accompanied himself on the piano – and The Style Council’s Shout to the Top both went down a treat. The chink of acoustic guitar signalled the start of the recognisable That’s Entertainment, the first of the night’s four Jam songs. The lyrical acuteness of this song about urban claustrophobia, as well as Art School’s hymn to teenage freedom, made it clear why the band were regarded in their day as the equivalent of The Kinks. The propulsive STaRt! – a cut from The Jam’s post-punk 1980s Sound Affects album – with its stabbing, staccato guitar lines, sounded a lot like The Beatles’ Tax Man. It dripped with the same ferocity and energy as the more recent 7&3 Is the Striker’s Name and Fast Car/Slow Traffic. By the time the two encores rolled around Weller was firing on all cylinders. He finished with the hard-rocking Come on/Let’s Go – introduced with the Ramones-like shout “One, Two, Three, Four” – and the brilliantly relentless Porcelain Gods, that careened out of control in a blizzard of echoey vocals and over-amped guitars. 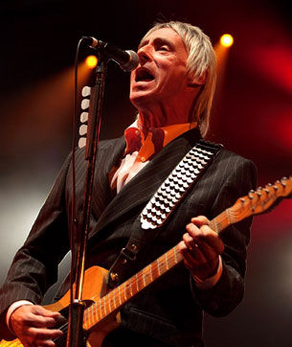 Previous Entry Paul Weller At The Fremantle Arts Centre, Australia (Oct 15) Vids! Next Entry More Back Stage Interview Footage Of Paul Weller In Australia!